Mulches not only make plantings look more attractive, but their most important function is to help retain soil moisture. They keep the ground cool to reduce moisture loss and prevent growth of grasses and weeds that would otherwise compete with plant roots for soil moisture. The recommended depth is 2-4 inches, and there are many mulch types you can choose from to complement your landscaping and garden design. Prevent soil compaction and aerate regularly to improve the efficiency of how the soil absorbs and retains water. Test the pH and make sure the levels are correct for the plants you are growing. Till in several inches of compost each year and amend with Profile soil conditioner. When deciding what to plant, consider native species as they are adapted to the area and can withstand the local moisture conditions, including periods of low rainfall or drought. Also consider plants that have been specifically bred as drought-tolerant, particularly for more at-risk areas of your yard. Ask one of our staff for recommendations of native plants. A good landscape design can help minimize water use. Start with graph paper and sketch your home, property lines, water faucets, existing trees and other permanent features. Plant large deciduous trees to maximize summer shade on the hot sides of your house. 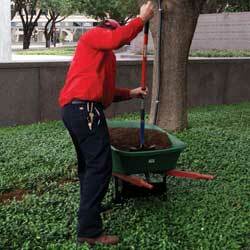 Combine groundcover in your plantings. This can reduce surface temperature up to 20 degrees. Plant a dense windbreak to cut down on drying winds. Group plants together by water needs and concentrate high water demand plants into one area. Plant rock gardens, native shrubs or drought-tolerant wildflowers on southern exposures. Install a drip irrigation system and use other water-saving devices like soaker hoses to minimize water loss. The system of “drip watering” that was originally designed for commercial use is now available to the home gardener. It has become very easy to use and quite effective. Drip watering applies water slowly and steadily directly to root zones in proper amounts. 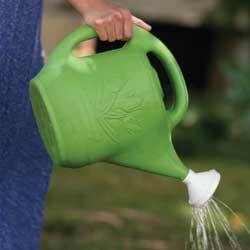 This saves time (less time watering and weeding) and money (less water). It also puts water where it’s needed without runoff or evaporation. You will want to look at our various styles of oscillating and pulsating sprinklers and choose the sizes and styles that meet your unique landscaping needs. 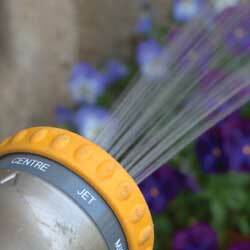 Other assorted nozzles and wands can also make watering easier and more efficient. The Four Channel Water Distributor allows several watering accessories to be used at the same time. It doesn’t take much to get started watering wisely, and not only will your plants thank you for providing adequate moisture, but you’ll love how much your water bill dries up!